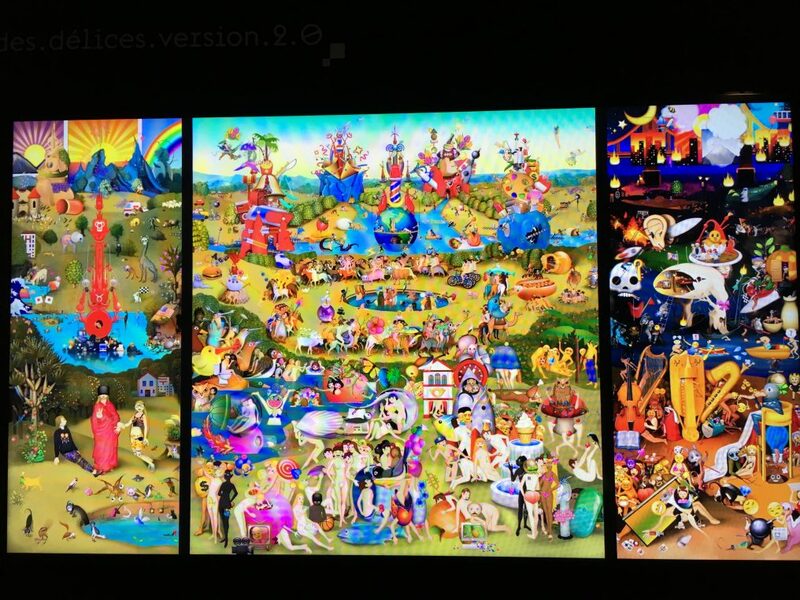 The new exhibition at Fondation EDF‘s space on rue Récamier, is devoted to how the internet revolution influenced artists. Half of it is to me too technical to be interesting but the other half is fascinating with music and movement entering the world of art. 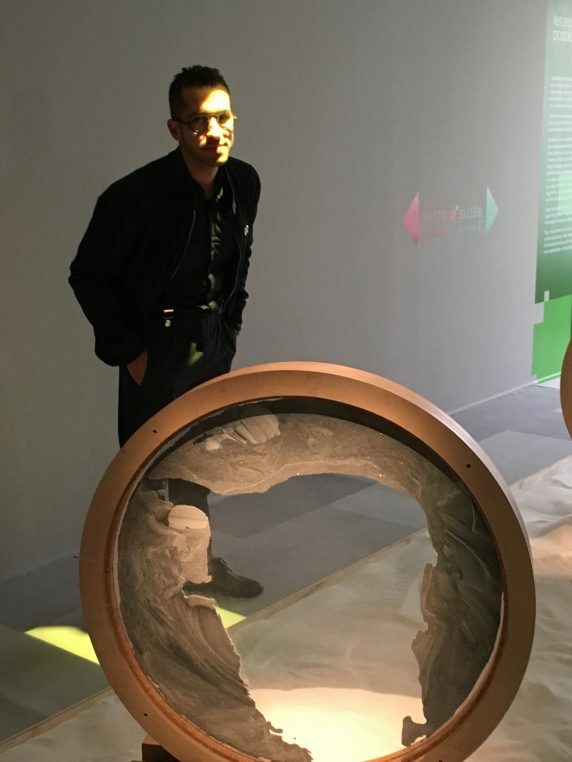 You can go directly upstairs at Fondation EDF and plunge into the poetical world fo Lyes Hammadouche who uses sand moving a in a glass circle to create sculptures. Here the installation with pure white sand and other grey ones, is spectacular. One circle turns at the pace of I tour a minute, the other one at one tour an hour and the third one at tone tour a day. The three works contain the same amount of sand and yet they are completely different. 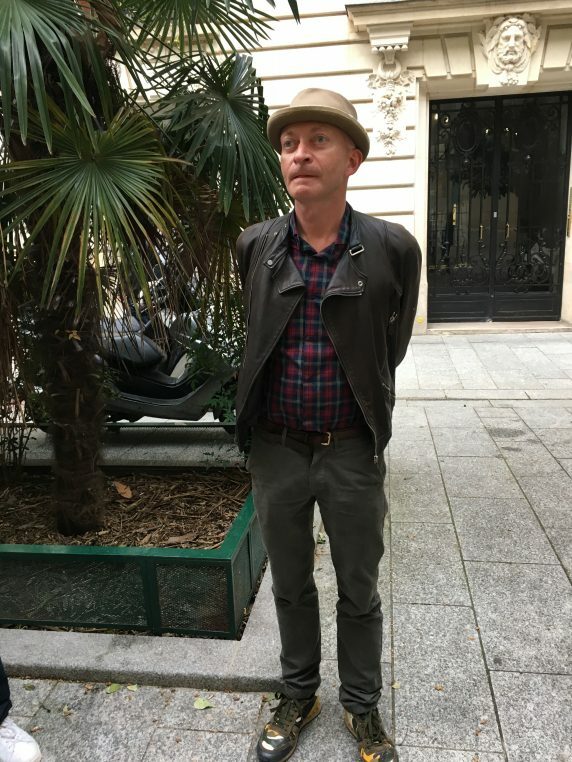 The charming artist is still at Ecole des Arts Décoratifs doing a PHD even though he is exhibited around the world in Mexico and in China. He uses ultra thin sand which serves for jewellery cutting and tells you passionately about his art. 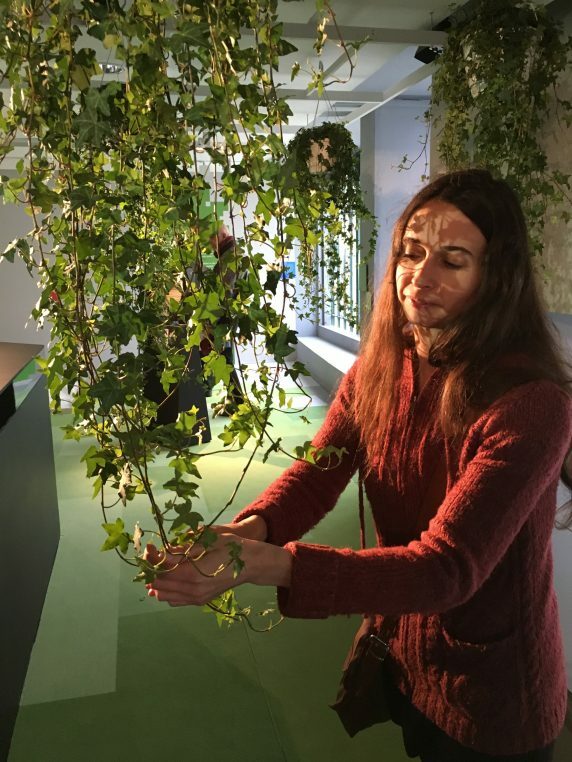 Next to him is Anaïs met den Anxct who, who with Gregory Lasserre, uses plants to generate music. Electronic captors are linked to the leaves which play music when you embrace them. It is the most poetic work of art I have seen/heard in a long time. The third colleague on the same floor is Véronique Béland. She asks you to apply your hand on an energy captor, which drives a piano to play music related to your energy and produces a postcard with your colors. My music was very dramatic and the color was dark purple. The following “victim’s”, was pink with a light and happy music… I don’t know what to think? 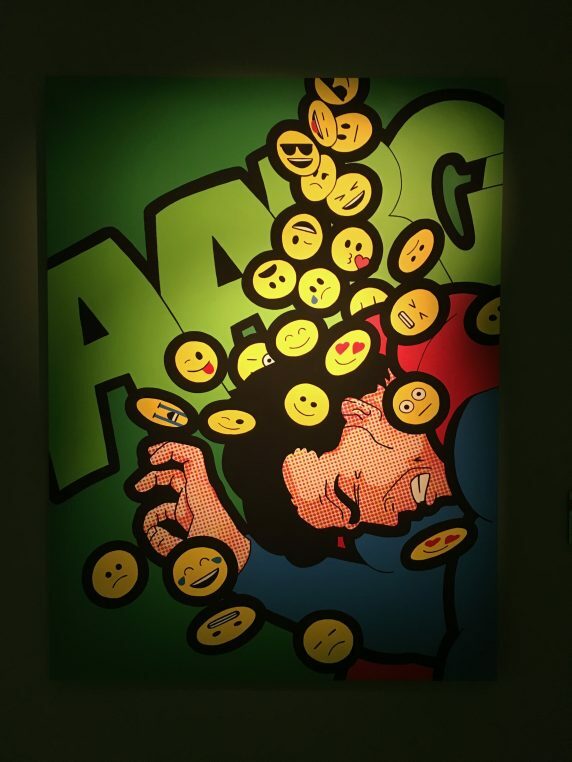 There is an interesting collage by Du Zhenjun called “Destruction” and video frescoes by Marie Julie Bourgeois, a “Garden of Emojis delights” by Carla Gannis and a “New Kiss” by Gustav Klimt designed by Lee Lewe Nam. “Just Amsterdam” is computer recreation of a Rembrandt portrait based on hundreds of computerized works by the artist.